This isn’t going to be a posting about fine food or alcohol; not even a bargain wine of the week. 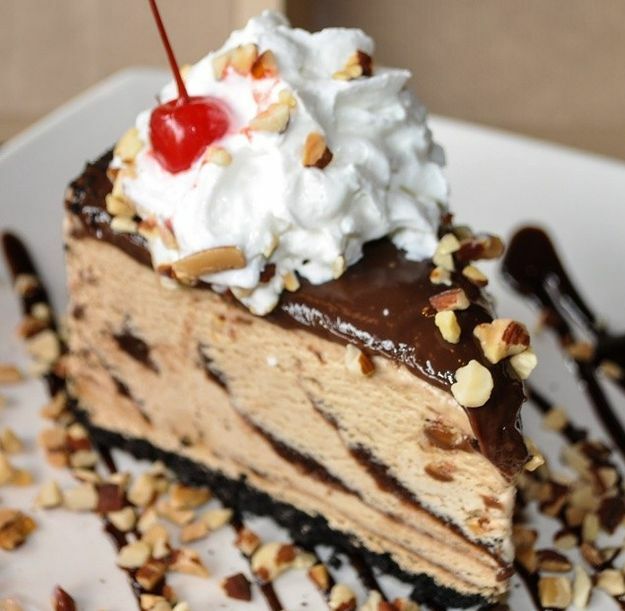 We thought we’d share with you one of our guilty pleasures in casual chain restaurant dining. We don’t do it often, but when we do, we have a short list of favorites. 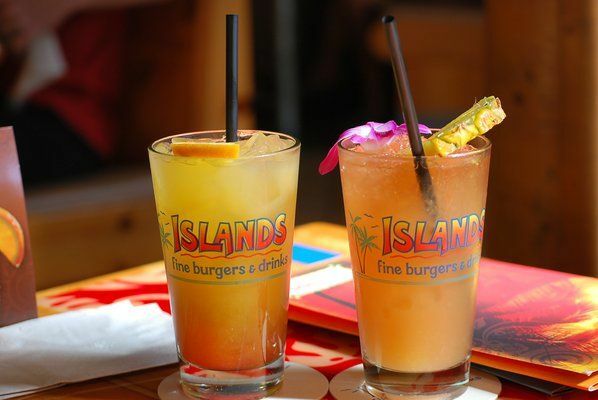 Islands Fine Burgers and Drinks is one of our top picks. Walking into the restaurant, it is a bit kitschy. It is all done in a surfing/island/rustic theme. The benches are light wood. 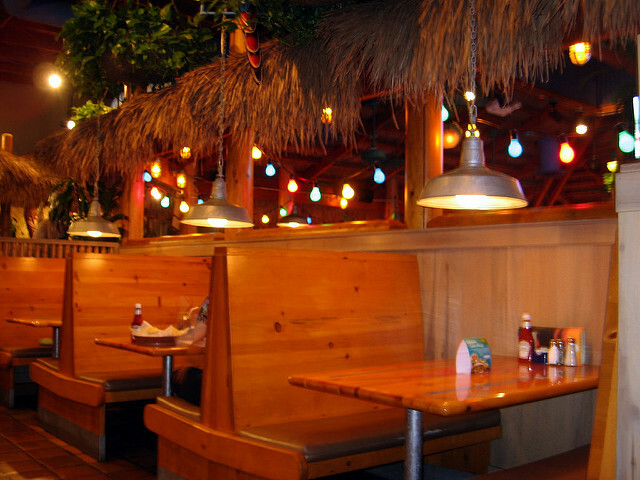 There are fake tiki huts adding to the surfboards and island decor. The place is usually pretty noisy due to bad acoustics. There are always surfing or skiing videos playing on the big TV monitors. We ignore all of this tackiness and go there anyway, even though our closest restaurant is about an hour or so away from our house. Everyone who reads this blog knows about my pickiness with ordering chicken. It is always overcooked, even in fine dining establishments and I get frustrated. Islands is one of the VERY FEW places I will order chicken. 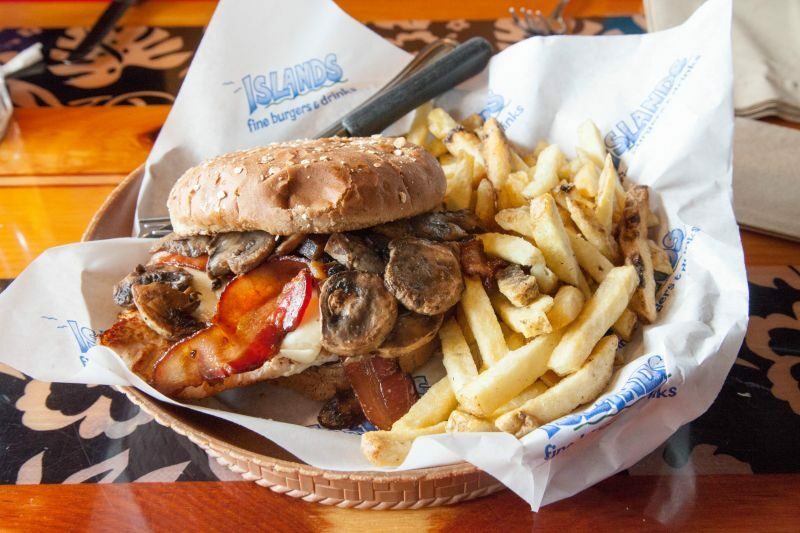 In fact, that is all I ever order at Islands. It is all that either one of us ever orders there despite them having a decent menu with many choices on it. When we moved back to the US, there was an Islands down the street from my mother’s home in Los Angeles. It was there we learned of the wonder of their Sandpipper chicken sandwich and their “crack” fries. 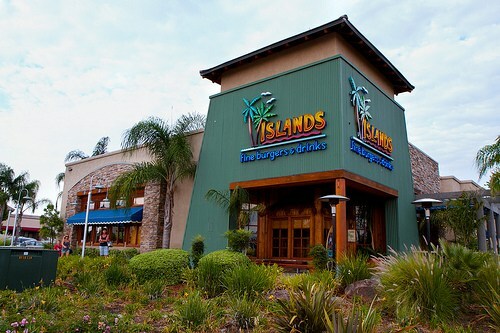 Islands locations are plentiful in Southern California. They aren’t so plentiful in Northern California; there are only two locations, both in the Sacramento area. So, what makes this sandwich so special and different? They start with juicy, perfectly cooked chicken every single time. To that they add Swiss cheese and garlic mushrooms placed on a slightly sweet wheat bun. It usually comes with lettuce and tomato, but we order it without and add bacon. It is a WOW. There is something about the combination that does it for me. I love it so much, I have tried to make it at home, but it just isn’t as good. The Brit comments: We both order this sandwich the same way. It is the best grilled chicken sandwich I know. What makes it even more impressive is that we have eaten it in multiple Islands location and it is consistently fine. I cannot think of a better chain restaurant dish than our modified Sandpiper. Add to that sandwich some of the best crispy, almost overcooked, fries and you can’t just eat one. 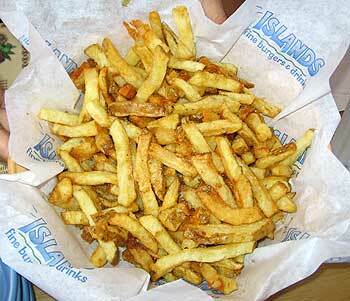 I know people who go there just to eat the fries. I am not even someone who enjoys fries for the most part, but there they are like crack for me and I eat them without any willpower. And they are bottomless! It’s a bad combination for my diet. Islands does have a bar and they do perfectly acceptable cocktails. They also serve dessert. I have had their Kona Mud Pie and it is very good. It is just what you would want from a place like that. Plentiful and tasty and they do those things well. The Brit comments: The cocktails are ok, but as lacking in imagination as is the case with most chain restaurants. They serve assorted beers, but with no focus on local craft beers. I have never been tempted to try the wine that they offer. If you have occasion to be in Roseville or Folsom, stop on in and try a Sandpiper chicken sandwich and some of their crazy good “crack” fries. You will be happy you did. I love their Northshore and Baja chicken tacos. I used to go to the Islands near the Westside Pavilion on Pico Blvd in Los Angeles when I was at UCLA Law School. I still love their fries!